Legends of Tomorrow embraces its sillier side and comes up with one of its best episodes to date. 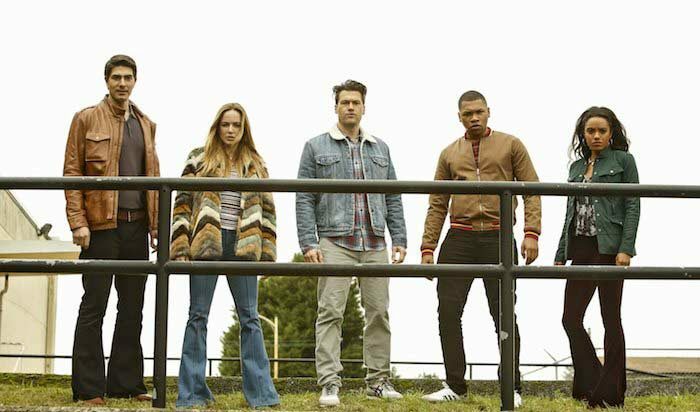 Though it’s had its fair share of great episodes, Legends of Tomorrow has often struggled to reach its full potential, particularly with the various real-life historical figures the team have bumped into over the course of a season and a half. Happily, the show redresses that balance handsomely this episode, with an enormously entertaining outing that fully embraces the sillier side of the premise, as the team encounter a young George Lucas. The result is the best episode of the second season to date. The mid-season finale cliff-hanger revealed that, far from being dead, Rip Hunter was actually alive and well – and living in 1967 Los Angeles, apparently directing a film based on his own adventures. With the Legion of Doom (Eobard Thawne, Damien Darhk and Malcolm Merlyn – pay attention at the back there) declaring that Rip has the Spear of Destiny, the stage is set for the Legends vs the Legion in 1967. Okay, so the Legion descend on 1967 and attack Rip, who turns out to have no memory of his former self and insists he’s a film student called Phil Gasmer. In doing so, the Legion scare the bejeezus out of Rip’s camera assistant, one George Lucas (Matt Angel), who immediately decides to give up his dreams of filmmaking and become an accountant instead. The rather brilliant knock-on effect of this is to render both Ray and Nate powerless and several magnitudes dumber, since without Star Wars, Ray didn’t decide to become an inventor and without Raiders of the Lost Ark, Nate didn’t decide to become, as the show puts it, “an improbably handsome archaeologist”. So Ray doesn’t have his suit (or his smarts) and Nate doesn’t have his steel powers, which he got from Ray’s super-serum. The fact that the time aberration caused by the Legion has actual consequences for two members of the team provides a level of investment that’s been absent from previous episodes. The stakes are genuinely high here and the fact that the resulting plot is basically a clever spin on Back to the Future is just the icing on the cake. In a nutshell, then, while Sara and Jax attempt to defeat the Legion, save Rip and secure the Spear of Destiny (and various related artefacts), Nate, Ray and Amaya have to try and persuade George Lucas to go back to filmmaking, so they can get their powers back. With that plot to work with, the writers have an awful lot of fun, throwing in some clever Star Wars references – first when Amaya gives a version of the “Help me Obi-Wan Kenobi – you’re my only hope” speech, and secondly, when the Legion push the four of them into a trash compactor. The fun doesn’t begin and end with the Star Wars stuff this week, though. Oh, no. We also get Rip complaining that the actor he’s cast to play Vandal Savage lacks the right amount of menace, which is an unexpected and delightful bit of meta-commentary. Legends of Tomorrow doesn’t go in for that sort of thing generally, but if ever there were an episode where they were going to get away with it, it’s definitely this one. See also: Rip referring to the (fictional, in his student film) Spear of Destiny as a McGuffin (a term popularised by Hitchcock, meaning an object or device in a film or book that serves merely as a trigger for the plot). Rip – or rather, Phil – is pretty much the gift that keeps on giving this episode, especially with his startled, high-pitch screams every time he’s attacked. It’s also a joy to see Arthur Darvill having this much fun (complete with pretty decent American accent) – so much so that one almost hopes they find a way to keep him as Phil for the rest of the season. Anyway, it turns out not to be the antenna, as it doesn’t appear to be working anymore, so that theory’s out the window. It’s also suggested that Leonard could be a remnant in the time stream (or a “Time Ghost”, as Rory puts it), but the most likely explanation is the one we’ve thought all along, that Mick’s feeling guilt over the loss of his partner and his desire to join the team. Stein goes further, labelling it cognitive dissonance, between Mick’s usual impulse, to smash things up and commit crimes, and his heart / head telling him that his place is on the team, as a hero. Either way, it will be interesting to see what happens when Leonard finally returns, later this season. Where does that leave us? Oh yes, after George Lucas is persuaded that the world needs the movies he’ll make, Ray and Nate get their powers back in time to save everyone from the trash compactor. There’s a fight between the Legends (including Jax and Sara) and Malcolm and Damien, during which the Legends secure both a piece of the Spear and the Medallion (the afore-mentioned artefact), which is also important for some reason. There’s a good bit where it looks like Rip has regained his memory too, only it turns out it’s just Phil, being surprisingly brave and bluffing, after asking Gideon what Rip would do to help his friends. Anyway, as is becoming the norm, Reverse-Flash turns up at the end of the fight and kidnaps Rip, leaving the Legends to escape with the Spear. This doesn’t sit well with Sara, who beats herself up over leaving Rip behind, although Jax gives her a good speech about how she saved the day and that they’ll get Rip back. They’d better hurry though, as the cliff-hanger shows he’s about to be tortured by both Damien and Malcolm, at Eobard’s behest. All in all, this is a lot of fun, with a funny script, genuine stakes for the characters and everyone involved clearly enjoying themselves. If Legends can maintain this level of quality for the rest of the season, we’ll be in for a treat. Tune in next time for a Legion of Doom-focused episode, entitled – yes! – The Legion of Doom. – George Lucas: “You guys are from the future? That you’ve somehow seen a bunch of movies that I haven’t even made?” Amaya: “Well, actually, I’m from the past, but that’s beside the point.” Amaya trying to get her head around Lucas’ movies and their importance is another great running gag. – It’s a shame they couldn’t have shoe-horned in a couple of Raiders references to go with the Star Wars stuff, but you can’t have everything. – It’s a little odd to hear DC properties name-checking Marvel properties like Howard the Duck. We guess that gag was just too good to resist. – Malcolm and Damien – or rather, John Barrowman and Neal McDonough – make a great double act and their scenes are a joy to watch as a result. Looks like we’ll be getting a whole lot more of that next episode, too. Legends of Tomorrow is available on Sky Box Sets. Don’t have Sky? You can catch up on-demand through NOW TV, as part of a £7.99 monthly subscription, no contract. A 7-day free trial is available for new subscribers.